Standing, sitting or sleeping on top of this deck, one could forget for a moment the bustle of Broadway below. 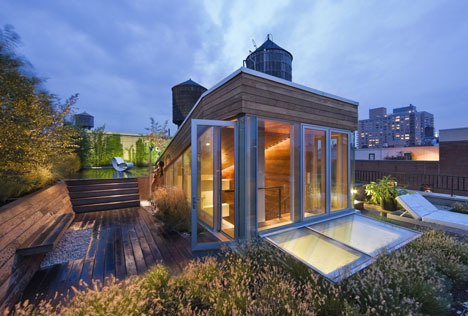 Wrapped by wood slats and bench seating and surrounded by sedum, grasses and other plants, the central architectural element rising from below is like a cabin rather than a way back down from the roof. Designed by Joel Sanders Architect, this central city residence is focused up and out. 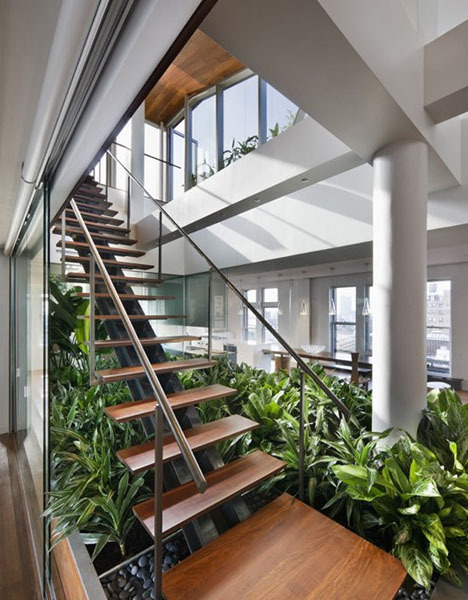 Plants are arrayed around the slim stairs leading to the rooftop area above, creating a bridge between the modern interior and organic exterior. The bulkhead housing this connection (along with generous skylights) also brings natural light down into the main apartment. The planted zone becomes a central point around which other rooms revolve – bathroom panels reflect this core gesture, and floor-to-ceiling wooden walls create further direct connections. While white defines core structural elements, wood panels, furniture and a multi-story chimney (which then morphs elegantly into a wall itself) help accent areas of use and connect the greenery to natural browns.